Abstract. Interactions between absorbing aerosols and the planetary boundary layer (PBL) play an important role in affecting air pollution near the surface. In this study, a unique feature of the aerosol–PBL interaction is identified that has important implications in monitoring and combating air pollution. Opposite trends in aerosol loading between the lower and upper PBL are shown on a wide range of timescales and data acquired by various platforms: from a short-term field experiment to decadal satellite observations and multidecadal ground observations in China. A novel method is proposed to obtain the vertical profiles of aerosol loading from passive sensors by virtue of varying elevations. The analyses of visibility, aerosol optical depth, and extinction with different temporal scales exhibit the similar trend, i.e., increasing in the lower atmosphere but decreasing in the upper atmosphere. Integration of the reversal aerosol trend below and above the PBL resulted in a much less change in the column-integrated quantities. The surface cooling effect, together with the change in the heating rate induced by the absorbing aerosol, unevenly modifies the atmospheric temperature profile, causing a more stable atmosphere inside the PBL but a destabilized atmosphere above the PBL. Such a change in the atmospheric stability favors the accumulation of pollutants near the surface and the vertical diffusion of aerosol particles in the upper atmosphere, both of which are consistent with the observed reversal aerosol trends. These findings have multiple implications in understanding and combating air pollution, especially in many developing countries with high emissions of light-absorbing aerosols. 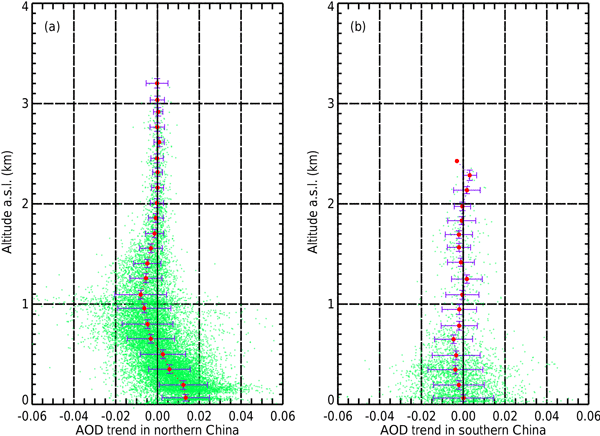 How to cite: Dong, Z., Li, Z., Yu, X., Cribb, M., Li, X., and Dai, J.: Opposite long-term trends in aerosols between low and high altitudes: a testimony to the aerosol–PBL feedback, Atmos. Chem. Phys., 17, 7997-8009, https://doi.org/10.5194/acp-17-7997-2017, 2017. 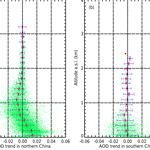 Opposite trends in aerosol loading between the lower and upper planetary boundary layer are found on a wide range of timescales and from different types of data acquired by various platforms in China. The reversal trend is consistent with the strong vertical gradients in the aerosol-induced atmospheric heating rate that unevenly modifies the atmospheric temperature profile and alters the stability differently. The findings have multiple implications in understanding and combating air pollution.